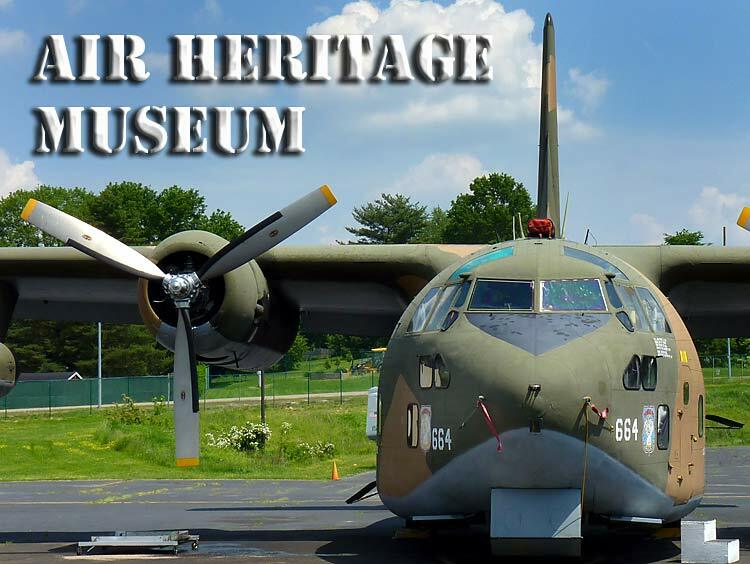 The Air Heritage Museum differs from most aviation museums because some of their aircraft have been restored not only cosmetically, but to a state of airworthiness. Their Fairchild C123 Provider, Grumman OV-1D Mohawk, and North American T-28 Trojan (recently finished) are all airworthy and travel to air shows throughout the US each year. Restoring a historic aircraft to static display is a challenge, but restoring these warbirds to an airworthy status is a huge accomplishment and says a lot about the skills and dedication of the Air Heritage Museum's staff & volunteers. The Fairchild C-123 Provider is a familiar visitor to many North American air shows. 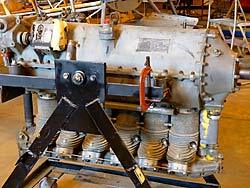 I asked one of the volunteers how they kept the tanks for the jet fuel for the turbojets from being filled with avgas for the big radial piston engines and vice versa. 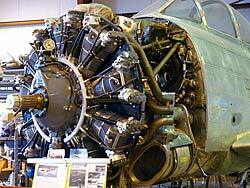 He replied that the GE J85 Turbojets were run on the same avgas used in the Pratt & Whitney radials. 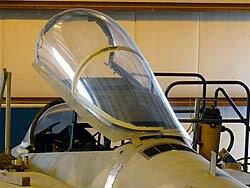 But on this aircraft they had been removed and the housings were left in place. The turbojets were originally used for extra thrust on takeoff with heavy loads and where they needed extra speed to get out of somewhere in a hurry. The thirsty little GEs drank as much avgas at idle as the big twin row Pratt & Whitney radial engines did at full power. The volunteer said it wasn't worth the expense to feed the turbojets considering the modest amount of weight they carried from airshow to airshow. Also it would have been an added expense for getting an FAA airworthiness certificate and annual inspections. 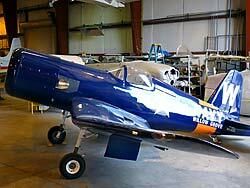 The Air Heritage's BAC Jet Provost is a jet trainer that I've never seen before in a US Aviation museum. But the most unique exhibit they have is a 1/2 scale F-4U Corsair. The volunteer on hand didn't know much more about the details on this replica. It looks like it could fit a human pilot but it appears to be a tight squeeze. I have no idea of what is planned for a power plant. My guess would be a 4 cylinder opposed Continental or Lycoming 4 cylinder. The paint work is extremely well done. Since I visited the Air Heritage Museum, the F-15 Eagle has been painted and assembled for static display and the North American T-28B Trojan has been completed and is airworthy and attending air shows around the US. 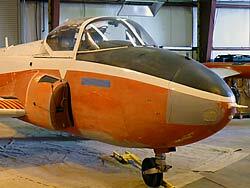 The BAC Jet Provost T3 has been repainted and looks great in its red & white livery. It is not clear if the jet is airworthy. 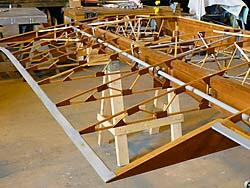 The restoration of the Fairchild 24 Forwarder is coming along nicely and the uncovered wings have been mated to the fuselage frame. 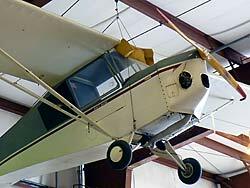 Three new aircraft have also been added - a Funk Model B-75L, a T-34 Mentor, and a Piper Super Cub L-21B. All three airplanes are airworthy and participate in north American air shows. 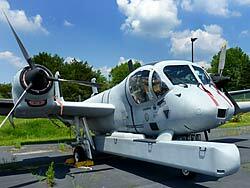 Check out the museum's web site for more current photos of these aircraft restorations. Other aviation related exhibits included an inline Ranger 6 cylinder aircraft engine and a Wright R1820 radial aircraft engine. Also on display were a WWII Nordon Bombsight, a Willys M38A1 Army Jeep, a Consolidated B-24 Liberator instrument panel, and the transmission and rotor hub of a Sikorsky UH-34 Helicopter. The Air Heritage Museum's staff and volunteers were friendly and happy to show you around and answer your questions. The Air Heritage Museum has a small gift shop carrying a modest supply of aviation related clothes & gifts. They also have some vintage aircraft parts for sale. There is no food on site but you there were fast food places not too far from the museum. Parking is free and close, and the museum is handicap accessible. 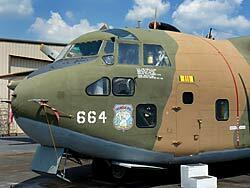 Visit the Air Heritage Museum Website for more information. 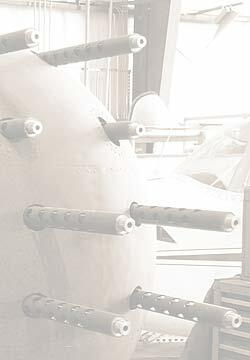 This website is not affiliated with the Air Heritage Museum.